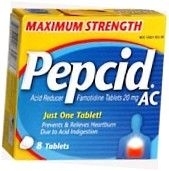 - Relieves heartburn associated with acid indigestion and sour stomach. - Prevents heartburn associated with acid indigestion and sour stomach brought on by eating or drinking certain food and beverages. - if you have trouble or pain swallowing food, vomiting with blood, or bloody or black stools. These may be signs of a serious condition. See your doctor. - with other acid reducers. - had heartburn over 3 months. This may be a sign of a more serious condition. - heartburn with lightheadedness, sweating, or dizziness. - chest pain or shoulder pain with shortness of breath; sweating; pain spreading to arms, neck or shoulders; or lightheadedness. - your heartburn continues or worsens. - you need to take this product for more than 14 days. Hydroxypropyl cellulose, hypromellose, magnesium stearate, microcrystalline cellulose, red iron oxide, starch, talc, titanium dioxide. For more information on this product please call 1-800-755-4008 (English) or 1-888-466-8746 (Spanish).